Happy Spring! Happy New Year! Spring is the beginning of the astrological year when the Sun moves into the sign of Aries and we are on fire with new beginnings and the energy to start new projects. Of course, we here in Maryland are hoping this means that the snow will all go away and we can start working on gardening projects! When reading last Friday’s article do you see that it is time now to commit to your Life Purpose. Are you ready to commit? Are you sure you know what it is? Think about scheduling your Spring Cleanup Session with me to get some clarity about next steps so you can use this Aries ‘New Beginnings’ energy to propel your life forward living your Purpose. If there is something holding you back, or some limiting beliefs that need to get out of the way, let’s get that done for you! Send me an email at rosemary@TheScientificMystic.com and we’ll get that appointment on the calendar pronto. This week is the Annapolis Film Festival. If you’re in the area do join us! Annapolis has films showing at different venues with discussions and panels and fun activities. What are you doing this Spring to have fun while learning something? Commit to putting something on your calendar like this activity. I think I will also schedule a trip to the American Visionary Art Museum in Baltimore. I am embarrassed to admit that I haven’t been there yet. Who wants to join me for a field trip? Explore this season as Aries gives you a lift into trying something new. Meet new people. Visit new places. Explore new ideas. This is the time of rebirth, renewal, rejuvenation. Be your beautiful Spring Self!!! P.S. 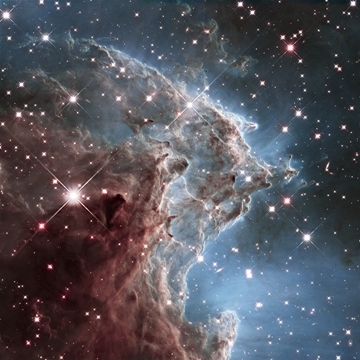 How do you like this Hubble Space Telescope picture? It’s the 24th Anniversary! I’m so proud to have been there to contribute to this project! ROSEMARY’S EXPLORATION: Step Into Your Bodacious Dream! Everybody has a dream. It might be a big dream or a little dream. It might even be an escape from something painful. It could be a dream founded on a ‘what if’ thought. We ask little children what they want to be when they grow up. Firefighter. Veterinarian. Teacher. Doctor. They have a dream. Most of them change the answer to that question many times before they choose a career but there’s always an answer, a dream. As an adult, you might feel trapped in the reality of where you are now and a ‘dream’ seems like a luxury you can’t afford. Or you might have a dream but it is a small, easily achievable one that won’t challenge you to grow. Remember when you were little and the sky really WAS the limit? I wanted to work on the NASA space program. That was my dream. I went to college, majored in Mathematics, worked for the Department of Defense for 14 years and THEN I went to work on NASA’s Hubble Space Telescope! I did it! I met Senators and Congressional Representatives, famous folks like Carl Sagan and Tom Clancy, astronauts – a dream come true. There were astronomers from around the world working with me. I got to travel – to Paris, to Huntsville, Alabama. (OK, Huntsville wasn’t a part of my big dream!) And there I was in my dream. I was only in my 40s and, yet, the dream was realized. What then? It was time to create an even bigger dream. I felt the call to become a Spiritual Healer. Not exactly what every Math major dreams of! But I followed through, studied different modalities, explored my gifts, and changed careers in midlife. I became a Spiritual Healer and Medium. And helping people is much more rewarding that meeting Senators and having a glamorous job about which I could preen and brag. MUCH more rewarding! NOW I dream big. I reach for the sky in a different way. I travel to meet up with clients and share my gifts. I am living my Purpose and I am constantly being called to reach out to more people, to share in a bigger way. The Dream keeps expanding. What is YOUR STORY? Have you realized the dreams you had as a child? Have you dared to dream big dreams as an adult? Where is your life now with respect to your dreams? And how BIG are those dreams? It becomes an easy thing to shrink our dreams as we experience life because it seems too challenging or, sometimes, even too dangerous, to follow that dream. But in the 21st Century we don’t have the luxury of dreaming small anymore. This is a time for each individual to show up for their Soul Purpose and LIVE BIG! The Planet and the rest of us need for you to show up in your Purpose. Even if it is scary, Dream Big. Autumn is finally showing up here! I’m ready to put away the Summer clothes but it’s stayed too warm to do that. I love watching the Fall colors come out and I can’t believe we have not yet had a cold snap to freezing temps. At least it is cooler. And one Baltimore meteorologist is using the ‘s’ word – snow – for Baltimore in the near future. Not here, though. Living this close to warm water keeps us warmer in the winter and cooler in the Summer – nice! What do you know about the weather in your area that makes you grateful that you live there? Surely there is something! This is Thanksgiving month in the US and I like to use November as Gratitude Month. Every morning I think of something I am grateful for almost before I open my eyes. It sets the tone for the day. Actually, I do this all year long! This weekend I think of my wonderful parents who are both on The Other Side now. They chose to be married on November 10, 1945 so that they would always have November 11, Veterans Day, as a holiday after their anniversary. I’m grateful to them for the wonderful life they gave me. And I’m reminded to be grateful for the veterans, like my Dad, who served their country. I may be a Dove now, but I know that my Dad was happy to be in the US Coast Guard during WWII. Happy Veterans Day to all the vets out there! 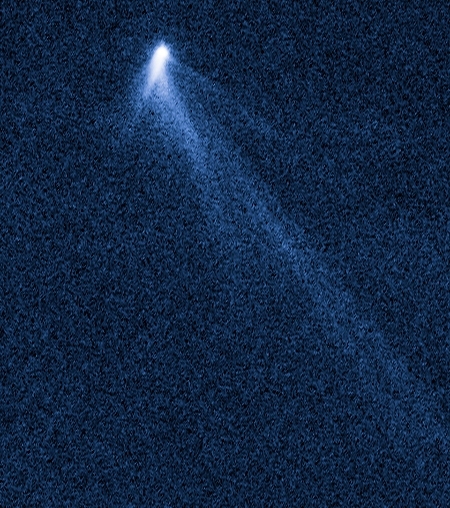 This week’s picture is an asteroid that appears to have multiple tails, like a comet. Transformation is not just happening to humans! This astronomical phenomenon has never before been seen; astronomers are searching for clues about the source of these tails! 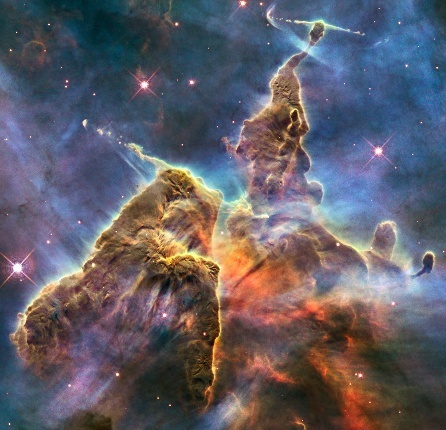 Enjoy this view from the Hubble Space Telescope! As the year starts to wind down and we get ready to move into holiday mode I urge you to consider getting some guidance about your preparations for 2014. What would you like to know about what to expect? Can you create an intuitive plan for the year? [YES! I’ll show you how!] My coaching clients are working on planning now so that January brings success without having a long pause at the start of the year. Let’s explore what this can mean for you. If you haven’t had a Complimentary Discovery Session with me yet, why not schedule one now and we can look at what you need to make 2014 your best year yet! Here’s where to apply: Discovery Session And if you’re ready, what are you waiting for? Let’s get some time together on the calendar so that 2014 is Your Most Successful Year! Welcome to all the new members of RosemarySpace! We’re glad you’ve joined us! Happy July from summery Maryland! It might be the Summer season here but there is a lot going on. No lazy days in the Sun for us! We only have one more week of Mercury Retrograde (hurray!) when communications can get muffled and confused. Continue paying attention to details, especially if you’re signing something, and, if you can, wait until after July 20 to sign. One cool thing about hot Summer nights is the coming of meteor showers. Put July 30 and August 12 on your calendars! Of course, they peak in the wee hours of the morning in the Eastern Time Zone, but it’s well worth getting up to see the sky show. The Hubble picture this week is a star-forming region about 10 million light-years away from Earth in the constellation Canes Venatici, the Hunting Dogs. Another great show in the sky! Today’s message from The Divine Feminine stresses the importance of learning about your Soul Purpose,. Do you sometimes wonder if you know for sure what your Purpose is? Are you confident that you are living that Purpose? Would you like to know your Life Lesson so it can become an ally in your personal growth instead of a constant stumbling block? All this information is in your hands, where your unique fingerprints have encoded in them your Purpose and your Life Lesson. There’s a lot more information there, too, and, while your fingerprints don’t change through your life, the lines in your hands do. If you’re curious, schedule your Scientific Hand Analysis session now. Check out the details here And, if it’s been over 6 months since you had your hands read, it’s time for an update! Meanwhile, I’m sending cyber-hugs to you all! Quite a week! We’ve had tornado and severe thunderstorm warnings to deal with [safely] while we watch the heartbreaking wildfire in Colorado Springs. We lived through this scenario last year when it was our house in Colorado that was in the path of the Waldo Canyon Wildfire. Thankfully, we learned our house survived intact and we sold it to a family that hadn’t been so fortunate. This year, it is the homes of friends that are threatened by the Black Forest Wildfire. We pray for our Colorado Springs ‘family’! This is the final week of the season of Spring. Summer Solstice is next Friday, June 21, at 1:03 am Eastern Daylight Time, when the Sun moves into the sign of Cancer. Are you ready for Summer? This is the time for big growth, just as our gardens demonstrate! And Cancer is about nurturing ourselves and each other. Make some plans for the longest day of the year. What would you like to bring into the Light? Uncover the lessons you are working on and shine Light upon them. There is still room for you to join us TONIGHT, Friday, June 14th at 7:00 pm EDT for the Conversation with The Other Side if you’re interested in getting a message of guidance from an angel, spirit guide, or loved one. Register Here. And if you can’t join us either live in Annapolis or online from anywhere, think about HOSTING your own friends at a Conversation with The Other Side (and you’ll attend for free!). Here are the details on hosting your own event: Click to learn more. Have a great week and enjoy your longest day next Friday! And please keep praying for those affected by the Black Forest Wildfire in Colorado. Are you connected with New Thought? This seems to be defining a sort of movement among humans. Are you willing to explore this? I could make a list a mile long and there would still be more beliefs at work. [As an aside, I’m glad I didn’t believe that last one because I did major in Math in college!] But often these beliefs are at an unconscious level within us and we are unaware that they are at work in our lives. But if unconscious beliefs are operating in our lives then what do we do to make a shift? The first place to do this is to examine our beliefs. Working with what we believe instead of trying to change the world around us is a powerful tool for personal growth. If we understand the concept of Oneness we look through the eyes of connection to others instead of searching for differences to separate us. I think we need to be open to the concepts that are being brought to our attention at any given time. In political discussions, the question to ask is, ‘Am I looking at this issue within the concept of the Oneness of all or am I narrowing my perspective to my own position without regard to others or the whole?’ In our families, do we act in the world as if we are a unit or are we constantly competing with others? In our work are we collaborative or competitive to the point of lying or taking unscrupulous actions? In a personal relationship it is easy to act unconsciously in a way that does not take the other person’s feelings, views, beliefs into account. What if, instead, we stepped into their shoes and looked through the lens of their reality and beliefs? Might we see things differently? 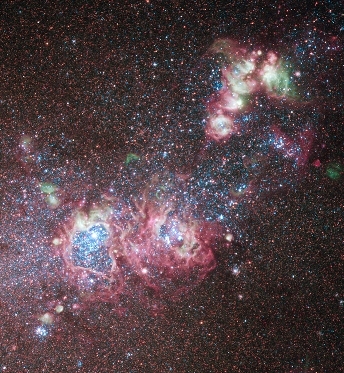 Quantum Physics is showing us that there is a connection through space and time that calls into question a lot of our beliefs about a mechanistic Universe. Modern mind-body medicine is showing us that our bodies are not machines but are so much greater than just some moving mechanical parts. All of this is a part of New Thought. We have greater understanding of The Greater. More evidence arrives constantly to show us that there are other sentient beings in the Universe. The Hubble Space Telescope, which it was my privilege to work on for 12 years, continues to reveal the secrets of the Universe so that we can better understand our place within this developing miracle. The people who have lived with narrow, stifling beliefs about their superiority over others, about judging others and finding them failing, about the need to convert others to their beliefs because they have ‘the Truth’ are starting to lose their power. Individuals are evolving into a New Human who understands that one can be a part of a whole, interconnected and related, while maintaining their individuality. Ask yourself how you understand Oneness in the 21st Century. Does the concept bring up any fear in you? Are you willing to see all who are inhabiting our beautiful Planet Earth as part of your own journey, for better or for education? Just observe this week the people around you and see if you can learn something about New Thought. Who is having the conversation about what is a growth topic versus what sounds like backward thinking? Do not judge for that is not a factor of Oneness. Merely observe. And observe your reaction to what you see and hear. Notice how others treat those around them. Peace on Planet Earth will come when her inhabitants embrace each other as Earthlings. Peace on a large scale requires that individuals experience peace within themselves. May the experience of Oneness spread Peace upon the Planet.